DECLARATION/OBSERVATION: I repost items that interest me: news stories, funny pictures, a few memes, and certain status messages of friends and family. I keep my lack of faith or religion to myself most of the time. If I do discuss it, it tends to be with my like-minded husband, Jarrod. 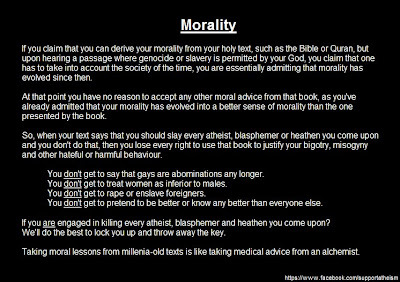 Yet, I feel compelled to repost this discussion of morality because it conveys what I feel about the morality of non-deist, atheist, and agnostic people who live a life that does not revolve around worship, fear of divine punishment, and/or expectation of an afterlife. I view morality as a human construct that stems from the avoidance of bodily or mental harm and causing bodily harm or mental harm to others. This means we know what is right and wrong because we know we would not want it done to ourselves. Those who do not develop this intrinsic sense of right and wrong have a legal system that has codified what is right and wrong. It is for this reason that the United States legal system did not evolve from religious texts, but modeled from the rationality of Ancient Rome. Likewise, societies all around the world have a codified legal system and most are not based on religious theology. What this image is imparting is that as a society, we understand that many of the horrible things in the Bible are not permissible today because our morality has evolved. We do not enslave humans, we do not stone adulterers, we do not force widows to marry their husband's brother, we do not make women leave their homes when they are menstruating, and we do not kill men, women, and children based on the orders of a religious figure. 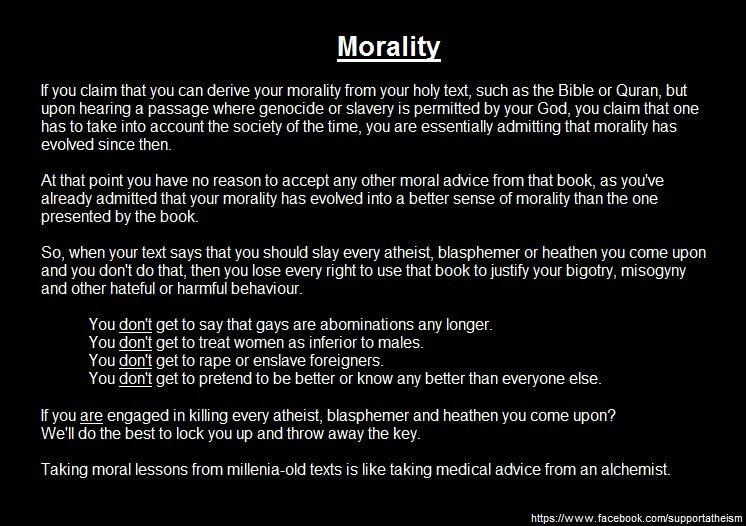 Our morality has indeed improved over time. Many have said that they base their lives on the New Testament and that society in the time of the Old Testament. Well, sorry folks, it's all the same god in that book. According to the Bible, everything that happened in the Old Testament was ordered by God himself and merely relayed via his prophets. If you want to say the New Testament is different, Jesus was quoted as saying that if your eye causes you to sin, to pluck it out. It was not metaphor nor a parable. I don't see a lot of cyclops out there. The writing is very clear. When humans decide to prosecute human slavery, religious stoning, etc., they are stating that they know better than the written testament of their faith. As humans, most of us have moved past the low-moral standards of the Bible and live lives according to a higher standard. ...to then use this book to judge other people or to say that their are not living their lives well, is ridiculous.